July is coming to a close in the next couple of days and August is hot on its heels. That means school will be starting soon and eventually, my yard work will slow down. But for now, the days are usually quite hot and the mowing and trimming still have to be done. Unfortunately, so does the weeding and watering. One of the worst things about summer lawn care, though, is how expensive it can be. All of the watering, fertilizing, trimming, and mowing can really cut into your monthly income. This is especially true if you forgot to budget for it. Luckily, there are ways to save on summer lawn care. One way to save on summer lawn care is to DIY it instead of hiring it done. With mowing costs between $100 and $200 per month, you could buy your own mower in about two months. If you can spare the time, this is one way to save a lot of money each summer. In fact, you can save hundreds, if not thousands, on lawn care over the life of your mower. When you don’t have time to do summer lawn care yourself, hire your kids to do it. If you have a child that is old enough, teach them how to mow and pay them for it. They’ll be eager to do it to earn spending money. In addition, it can cost you lots less than paying someone else. Another way you can save on summer lawn care is to exchange services with someone else. Ask a neighbor if they can mow for you in exchange for babysitting, sewing, or some other service. In other words, barter for summer lawn care instead of paying cash. Each person can benefit from the exchange and save money overall. Did you know you can collect rain water to use for your lawn and garden? There’s plenty of info on the internet to help you get started. Furthermore, your County Extension Office may have information that can help. Using the water that nature provides can lower your monthly water bill. Furthermore, purchasing a simple rain barrel system costs only a couple of hundred dollars. Your summer lawn care costs can also be controlled by limiting how often you water. Sprinkler systems can have timers attached to prevent overwatering. It also helps to water your lawn, trees, and shrubs at night. This will reduce evaporation, which saves you money in the long run. When it comes to planting, go for grass that is drought tolerant. Then, use mulch around shrubs to keep moisture in. Although time consuming, you can also lower summer lawn care by growing a garden. Rather than watering and mowing grass, use some of the space to grow vegetables instead. This can keep your grocery bill down and save you money overall. Several years ago, my husband and I co-owned some expensive outdoor equipment with friends. Each of our families trusted each other and we were close neighbors which made the plan feasible. Purchasing high dollar machines our families needed, but didn’t use constantly, worked well for us. It lowered the amount of money we each had to spend. 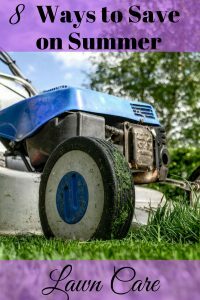 You could use that same idea for lawn care equipment and keep costs down for your family. Once you have lawn care equipment, you can also keep costs down through good maintenance. Here are a couple of tips. Always make sure you use the right kind of fuel or fuel mixture for your mower. Consult your manual to be sure. Don’t forget to change the oil as the manufacturer recommends. Sharpen the blades when they begin to dull and rip the grass. Change the spark plugs every so often to ensure you can start your mower. You should get about 100 hours before changing them is necessary. Charge, or change, the battery as needed. Some mowers have fuel filters. Look to see if yours does and it needs to be cleaned or replaced. As you can see there are lots of ways to save on summer lawn care. If your lawn care is chewing a hole in your budget, try some of the tips mentioned to save some green. Do you hire out your summer lawn care? What an awesome post. I just read it from start to end. I learned something new after a long time. Keep it up… Thanks. I’m glad to have helped you. Thank you for your comments and for dropping by!